This week our birders had the pleasure of being graced by one of the most beautiful birds in Florida. The elegant and unmistakable Swallow-tailed Kite made its way to Fort Jefferson on the Dry Tortugas. This graceful black and white bird circled the fort several times, enough times that we were able to see its long, scissor-like tail, and long, narrow and pointed wings. The photo session was in full swing. What a pleasure to see this magnificent bird. The Swallow-tailed Kite, the largest of all North American kites, was chosen as the symbol for the Great Florida Birding Trail and is displayed on their highway signs across the state. At one time, their breeding range included 21 states and extended as far north as Minnesota. 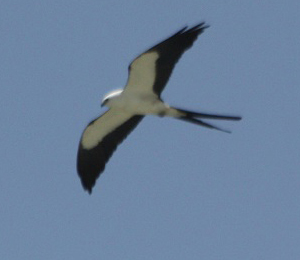 Now most of the population of the Swallow-tailed Kite is restricted to Florida with a small amount breeding in six additional southeastern states. If you are fortunate enough to watch one of these kites in flight for a sufficient amount of time, you will be able to observe the way it plucks a flying insect out of the sky or even a young bird from its nest and then dine on the meal while soaring through the sky. These birds feed completely on the wing, mostly on lizards, frogs, snakes, small birds, and insects. They drink on the wing as well, swooping down low to get water from the surface of a lake or river. The juveniles can be distinguished from their elders by the absence of the deeply forked tail. Arriving in Florida from South America late February to mid-March, the Swallow-tailed Kites are most obvious at this time of the year as they bring moss, sticks, and other nesting material to their preferred nesting site. Their nests are commonly in the top of the tallest trees in a cypress or pine stand. The adults and juveniles fly south after the two or three of the young fledge, but only after assembling in communal roosts in South Florida prior to their migration to South America. We thoroughly enjoyed our visiting kites and their aerial grace as they would swoop and twist above the trees while hawking insects. The sight of a Swallow-tailed Kite soaring through the sky is absolutely unforgettable and a sight essential for birdwatchers from all walks of life. Come out and join in the sights and fun. You'll be glad you did!